That the Edo period, firefighter who accounted for Nejirihachimaki firmly in Shirushihanten Speaking of celebrations, was on the rice cake has been passed as one of the SKETCHES of Edo. 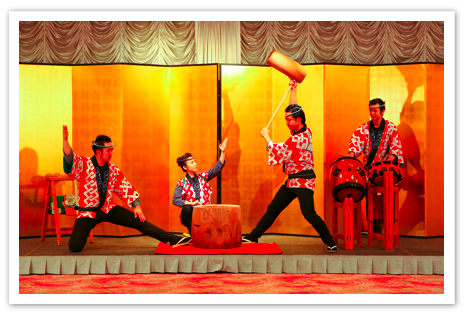 From the old days of the Edo period, pestle or around the air has been popular on the people to "celebrate Mochi", puppet big punch, and or summary of the rice cake, full of performance properties that are not found in the other, to the stylish celebration Arts was developed into today and is - of "Medeta?a" is "to celebrate mochi performance". Ebulliently, they attached a rice cake. Along with the sound of drums and lively festival music, while received a cheer and clapping from customers while tell us the Edo. In the case of general banquet is from 4 persons organization. If the wedding reception is from 3 people organized. (Festival music of the wedding reception is the MD sound source). Rice cakes they got, will be served to everyone who at the two types of flour and red bean paste.